'Irish' is a person who if they [had] appeared in a 19th century Scottish census would have been labelled as born in Ireland. The aforementioned census returns did not usually distinguish which county or town in Ireland the person came from (there were a few exceptions). But there are other sources which did make this distinction, one of which I will draw on were the Glasgow Poor Relief records housed at the Mitchell Library in Glasgow. There are 1699 Kennedy records (plus 2 Kennedays plus maybe some other variations I haven't looked for yet). There is a small amount of double counting which I have ignored for these purposes. In a few instances a town was listed; in a larger number of cases, only 'Ireland' was stated. Here are two summary counts, the first in raw format, in the second I have reassigned the town level records into the appropriate county totals. 'Dublin' is assumed to refer to Co. Dublin. Ballynahinch has been assumed to be the larger location in Co. Down and not the smaller location in Co. Tipperary. I hope Ballynahinch, Co. Tipperary won't be offended - I will update the article when I have examined that record in case it has further clues. The Poor Relief records are a treasure trove of genealogical information and I plan to make extensive study of them. For my first visit I picked 5 to look at which I will discuss elsewhere; in this article I will describe the one Irish one I picked, relating to a male Kennedy from Letterkenny in Co. Donegal. I am omitting the names and spouses details of his children out of respect for the family's privacy, even though the record is past the disclosure dates. When I have completed my studies and have a better idea of what happened to the children and whether there are living survivors, I will review this. This record relates to a claim for relief for the three youngest children of William Kennedy, a cattle dealer from Letterkenny, following the death of his wife Mary McDermid or McDermott and was presented in Glasgow on 23rd October 1900. The children were living in William Street in the Anderston district of Glasgow with their maternal grandparents. William and Mary married in Londonderry in 1876 and had five children. The claimant children were all born in Londonderry. According to the claim, Mary left the family house in Bishop Street Londonderry because of her husband's cruelty and took the children to Glasgow c. 1898. At the time of the claim her husband's exact whereabouts was unknown but he was believed to still be in Londonderry. The initial decision was to send the children to the poorhouse and 'apprehend' the father. What happened to this order is unclear as in 1906 the court case came up again and the order was repeated. On May 25th of that year William Kennedy was apprehended in the Corn Market Londonderry and brought before a court (its unclear whether this was a court in Ireland or Scotland). The record says of William 'he is however a useless drunken creature and picks up odd jobs in the Derry Quay'. In court his photo was taken and bail awarded at five pound. He pleaded not guilty but the judge discounted his claim that he had looked everywhere for his children. One married daughter gave evidence against him but the other one appeared in his defence. He was sentenced to 60 days imprisonment, and later made to pay for the support of the children. His brother Thomas Kennedy, a cattle dealer in St James St Londonderry, was written to to see if he could look after the boy. 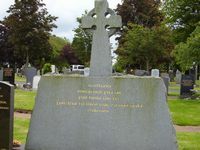 The final entry on the page states that William Kennedy died in Londonderry on 15th September 1911. He was Roman Catholic.